These are the words of Rachel Joy Scott. On April 20, 1999, Columbine High School became famous for all the wrong reasons. Students Eric Harris and Dylan Klebold became mass murderers killing 13 and wounding 20. 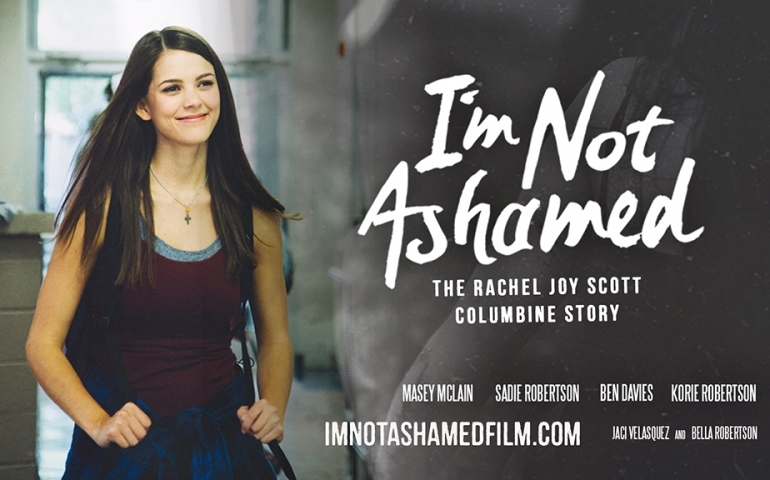 The new movie “I’m Not Ashamed” tells the inspiring true story of Rachel Joy Scott — who was the first student shot and killed in the Columbine shooting. Today, Rachel’s story has been heard by more than 20 million people, and her parents continue to share her legacy to the world. The film narrates from Rachel’s journal entries as well as her parents’ stories of her life. Rachel was a student who did not have a perfect life. Just like most, she struggled with peer pressure, acts of recklessness and protecting her faith. The audience will be in witness to her life and final moments on earth when she is questioned at gunpoint, “Do you still believe in God?”. What makes this film so beautiful is the rawness of her heart and her testimony to endlessly love and care for others, just as Jesus did. Categorized in the genre of drama, many young adults may find common ground in Rachel’s struggles. “I’m Not Ashamed” is well worth watching. It definitely challenged me to think about how far I would go to defend my faith. The life story of Rachel Joy Scott is very powerful. The production film did excellent work transforming the true story into a motion picture. The authenticity of the movie is so heartfelt, I would encourage one to bring tissues and a friend. Jamie Gerbrecht is a senior who also saw the movie. “I’m Not Ashamed” took her by surprise in the realistic portrayal of Rachel, as she was not this perfect Christian girl. “The story in itself is so moving and the fact that she knew she was going to touch millions in some shape or form gave me chills,” proclaimed Gerbrecht. Today, Rachel’s parents have taken the loss of their daughter as an opportunity to spread kindness to schools, businesses and communities throughout America. There non-profit organization, Rachel’s Challenge, has changed the lives of many students victimized by bullying and violence while also demonstrating the importance of respect and acceptance of others. I have personally heard this story told by her family when I was in high school, and it still stays in my heart today. I encourage students to see this film and look into this story as a reminder to treat one another with kindness.